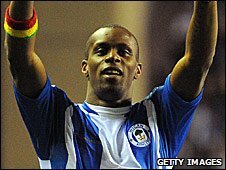 Wigan striker Henri Camara has joined Stoke City on loan for the rest of the season, reports BBC Radio Stoke. Camara, who has scored six goals for the Latics this season, almost joined the Potters on the final day of the previous transfer window. The 31-year-old becomes the third player to join Stoke in the January window, following the signings of Matthew Etherington and James Beattie. Camara has won 39 caps for Senegal, scoring nine goals. He first moved to English football in August 2003, joining Wolverhampton Wanderers from French side Sedan for £1.5m. Camara finished the season as the club's top scorer, but went on strike when Wolves were relegated from the Premier League. He went on to have loan spells with Celtic and Southampton before joining Wigan for £3m in 2005. Camara has found opportunities at the JJB Stadium limited under Steve Bruce, and spent the second half of last season on loan at West Ham.